"Reservoir Hydropower systems can increase water flow through the turbine during periods of peak electricity demand." The output of all types of generating plants are measured in watts - a unit of power. For example, a 1,000-watt generator provides enough power to light up ten 100-watt light bulbs. 1,000 watts = 1 kW. 1,000,000 watts = 1 MW. "Only 3% of installed dams are used to generate electricity." A Reservoir hydropower system is easily recognized by its dam, which typically holds back a large body of water. Many of the lakes behind these large dams stretch for several miles, and are often used as recreational destinations. Hoover Dam near Las Vegas, Nevada is 726 feet high and creates Lake Mead. It has a power generating capacity of 2.8 billion watts (2,800 megawatts). 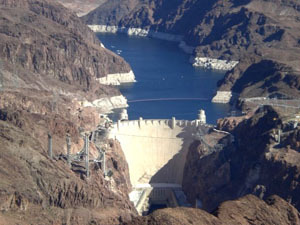 In addition to supplying electricity, the dam is part of a water management system that provides water to 25 million people in the Southwest United States. In a Reservoir hydroelectric system, the lake created by the dam serves two purposes. First, it creates water pressure at the bottom of the dam to power the turbine to generate electricity. Second, it provides reserve water capacity to generate more electricity during peak demand periods. The height of the dam determines the pressure at the bottom, created by the weight of the water behind the dam. 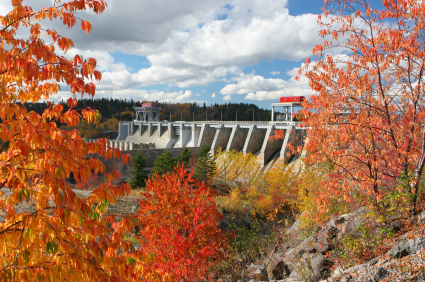 The hydroelectric turbine sits at the bottom of the dam (or sometimes even further downstream), allowing it to take full advantage of the pressure created by the dam. The amount of water moving through the turbine can be controlled, allowing the Reservoir hydro system to vary the amount of electricity it produces. Reservoir Hydro systems, by virtue of the large body of water they hold in reserve, have tremendous capacity to handle peak electricity loads. During light usage periods, the amount of water flowing through the turbines is reduced, generating less electricity. This allows the natural water flow of the river to add more water to the reservoir, raising the water level. During periods of peak demand, this reserve capacity is drawn down, allowing more water to flow through the turbine that the river alone could supply. High power output is characteristic of large Reservoir systems. These projects are typically rated in hundreds or thousands of megawatts. The Three Gorges project in China (shown at left), the world’s largest reservoir project to date, is projected to deliver a staggering 22.5 billion watts. The Three Gorges Dam spans the Yangtze River in China and is the largest hydroelectric project in the world. The dam can currently produce more than 18,000 million watts (megawatts), and when finished, it will contain 32 main generators with a total output capacity of 22.500 megawatts. Built as a green alternative to coal-fired generators, the dam eliminates the discharge of about 100 million tons of CO2 per year. 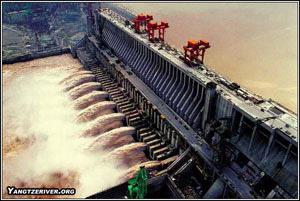 Like other dam projects, a major objective of Three Gorges Dam is to control flooding of the Yangtze River. In 1954, a major flood on the river killed 33,000 people and displaced another 18 million. Another flood in 1998 resulted in billions of dollars in damage, killed more than 1,500 people, and displaced more than 2 million. The new dam is expected to completely eliminate these massive floods, and reduce the frequency of major flooding to once every 100 years. Most dams, in fact, are constructed for flood control or to supply water to communities and agriculture - not for electricity generation. Today, only about 3% of installed dams are used generate electricity. This creates a tremendous opportunity to produce clean, CO2-free electricity from these dams with virtually no incremental environmental impact. The very large output from Reservoir systems makes them suitable for providing power to large cities, although there are usually many miles (sometimes hundreds) between the dams and the populations they serve. You’ve probably seen rows of high-tension lines that transport these millions of watts across the country. Unfortunately, an appreciable percentage of this power is simply lost along the way due to transmission losses. Streaming Hydropower projects, discussed in the next segment, can help reduce these transmission losses because their smaller size allows them to be located closer to the point of electricity usage. Obviously, there are environmental downsides to large reservoir projects. Many early installations did not make adequate provisions for fish migration upstream, requiring expensive remedial efforts to solve the problem. Another issue is the reservoir itself, which floods lands that may have been long-standing habitat for humans and other species. These issues are discussed further in Part 3: Environmental Considerations.